Sacha Christie - Infomaniac Housewife: Col Charles Halt Slams Capel Green Film Project. "Do not use my name, do not use my memo and do not use my tape"
Col Charles Halt Slams Capel Green Film Project. 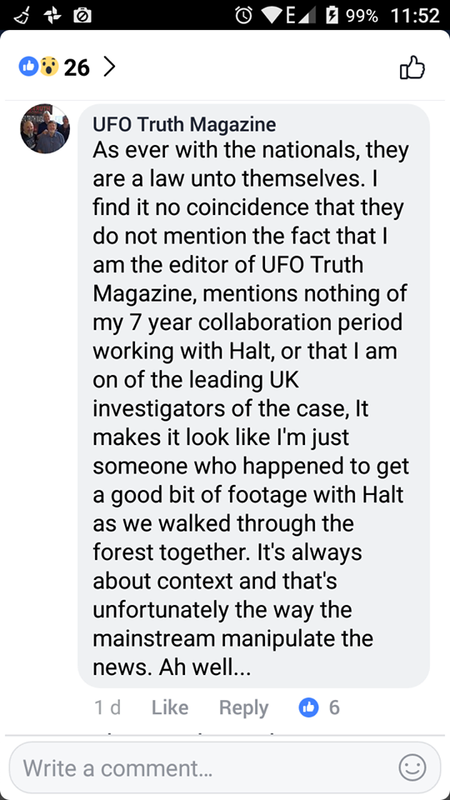 "Do not use my name, do not use my memo and do not use my tape"
You may be aware that recently Gary Heseltine of UFO Truth Magazine has repackaged the Rendlesham Forest Incidents in a marketing ploy to drag Warren out of the mire he is in, and obviously, to make a name for himself. Warren constantly berates the rewriters with his unerring asinine disdain for everyone, yet here we are. 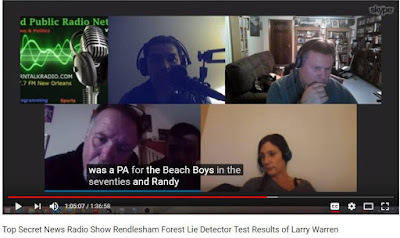 Capel Green, The Larry Warren Show. If you take a closer look at this shiny affair which looks pretty good don't you think? Look behind the curtain and it's Gary. The Wizard of Oz. I honestly don't think Dion has a clue about what he has walked into, he obviously has bought the she's just obsessed, it's a fatal attraction thing. Yes that is exactly what Gary Heseltine is saying this is about while Ben Emlyn Jones peddles the I am his ex landlady and I have unrequited love and am bitter lie. I think it's supposed to send me into a bunny boiling rage but I just look at them and wonder, "What is the point of you?" Whatever it is it endlessly backfires. Then they find something to cry about and play victim after being the aggressor. Ask a question, they assume the foetal position and cry "Troll"!!!! "Hater"!!!. In the Jo Lomax show a few nights ago Heseltine was describing how Warren had seen a red mist on the ground... Oops. Actually, it was YELLOW and a red LIGHT came to the yellow fog and touched it and it was all sparkles and shards of different coloured light. Not red. But he had a hissy fit over an article in a news paper where he wasn't called 'Britians leading Rendlesham researcher'. That was after he gave them a video of Col Halt that was supposed to be confidential, off the record. People do stupid things when they are desperate don't they. Who will trust him after that? But he felt morally obligated to release this now while the witnesses are still alive? He wants everyone to work together. Now he has a film to make. Airmen May Have Been Abducted, The Sun Newspaper Article. 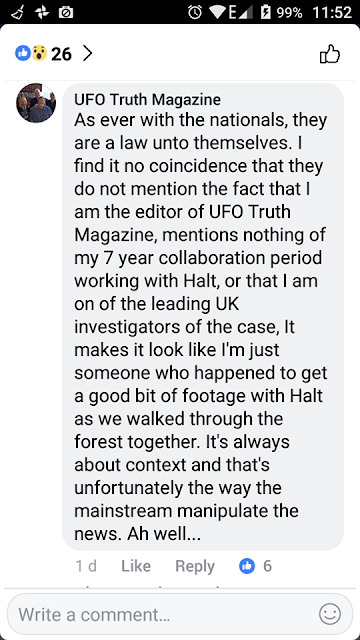 I am currently producing a feature length documentary about the Rendlesham Forest Incidents which you were clearly a significant part of. You may or may not be aware that the original named military whistleblower of the Rendlesham Forest incident, Larry Warren, has recently undertaken and passed a stringent polygraph test facing a wide ranging series of questions which was conducted by one of Britain's foremost examiners (having completed over 2000 tests). In light of this successful polygraph result do you wish to make any comment about it? As a reference for the style of film production this will be, here is a link to the first extended trailer which went public on the 28th December. I hate to tell you but you are being had. 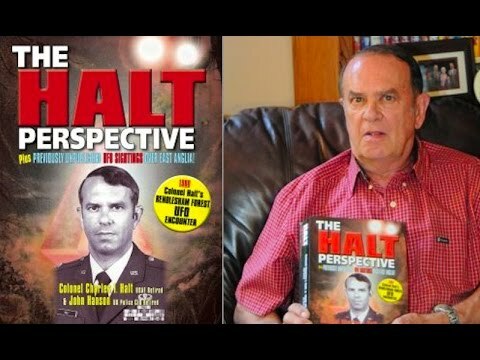 Suggest you read "The Halt Perspective" before getting egg on your face. For starters Mr. Warren has lied about his involvement on the first night (the events unfolded over 3 nights). He was not present with us at the site the third night. There were no entities or a physical craft on the ground. The event on the first night occurred in the forest. The night I was out with a team what we witnessed was not at the site Mr. Warren claims. Mr. Warren was separated from the AF as unsuitable/undesirable for the convenience of the government. In other words kicked out. His testimony has changed through the years as he's learned details from real participants. He's asked several of his former associates to lie to support him (this is documented) Every serious researcher has written him off as a very convincing liar- even his mother made a comment to that effect. Talk to any other serious researcher (I can give you many names), other than Gary Hesiltine who is using him and you'll get the truth. Even Peter Robbins who really wrote the book Left at the East Gate will verify the facts. Several years ago Mr. Warren claimed to have passed a voice stress analysis. Guess what, I have documented proof he failed. He may have passed a polygraph session but do your homework there are multiple ways to beat the test. You might ask Mr. Robbins about his fraud activity and association with Operation Bullpen.Your case and problem. Do not use my name, memo or tape. By the way the original whistle blower was cops named J. D. Engles and Jim Penniston who told of the events to the authors of Sky Crash. Even though they didn't get the story right they started the ball rolling. "Do not use my name, do not use my memo and do not use my tape"
Should be an interesting film then. Well I actually can't wait to see it. We will see what his current version of events is, after all he really does keep changing his story and his version will then be set in stone, so he better make up his mind about which version he likes best and stick to it. If you read this this blog here, you will see and hear him say in July 2015 that on the 27th of December 1980 he was in driving around with friends in a car, they went to Ipswich. Then when you go to the interview he gave Sid Goldberg in Toronto in 2016, only sixteen months after he spoke in Filey, he says he was in Germany and didn't get back to base until the evening, just in time to get ready for his shift. He also makes outrageous claims that he Co-signed the band Metallica and was paid half a million dollars finders fee. He is saying HE discovered Metallica!! 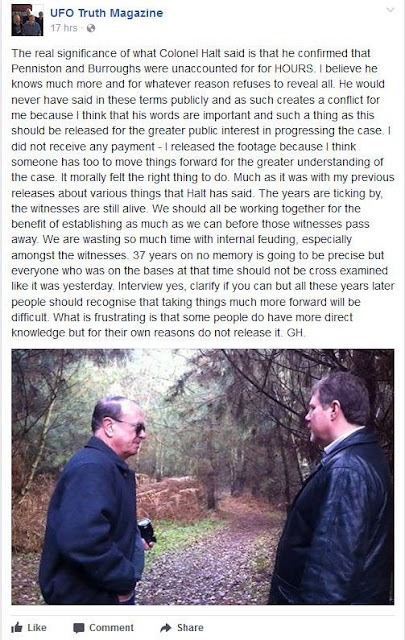 No this has nothing to with the Rendlesham Forest Incidents but it has everything to do with the kind of man he is. He tells lies all the time and he tells really BIG ones. In another recent interview he states that in the late 70's he was the PA for the Beach Boys!!! Now he has met John Lennon three times and also Frank Sinatra, the list of dead celebrities he knows is endless. He reckons he has evidence, photographs of the events, one from the DoD, we have seen these photos before and every time they do the rounds they have a different story attached. 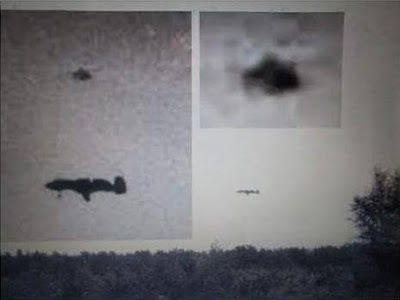 The A10 photo has been categorically debunked. 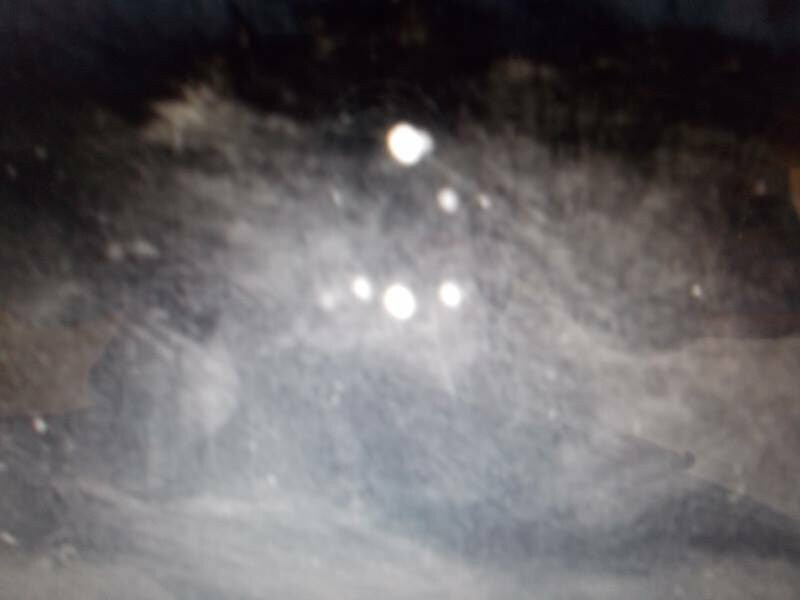 The photo below originally was said to have been taken by a guy called Mike, an accountant who lived by the base and took photos. 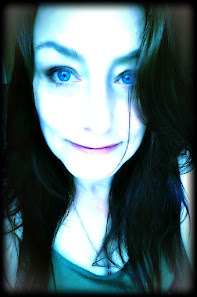 An elaborate story was conjured and told to Georgina Bruni who accepted the photos as evidence. One week later he calls her and 'admits' it was actually him that had taken them and then another elaborate story about smuggling them out of base in a mug he bought in Germany. He didn't go to Germany though so that is not possible. He also asked Steve Laplume to lie for him and say he had smuggled film cannisters out of the base for him. Read Steve's statement here. If you really want to know what happened, buy yourself a copy of Georgina Bruni's book. 'You Can't Tell The People'. I am not saying anything much that is new. I'm digging into his past and finding that many people have debunked him over the years. but he just comes back with more stories, more evidence. More lies. Mike the accountant photo, now it's a DoD image according to Warren. Even though I have shown his lies time and time again, always with evidence of his own words, not me making things up, actually showing you screenshots of the things he says yet Gary Hesseltine reckons I am just a bunny boiler. I think he is a misogynist and Warren thinks I/we should be murdered. 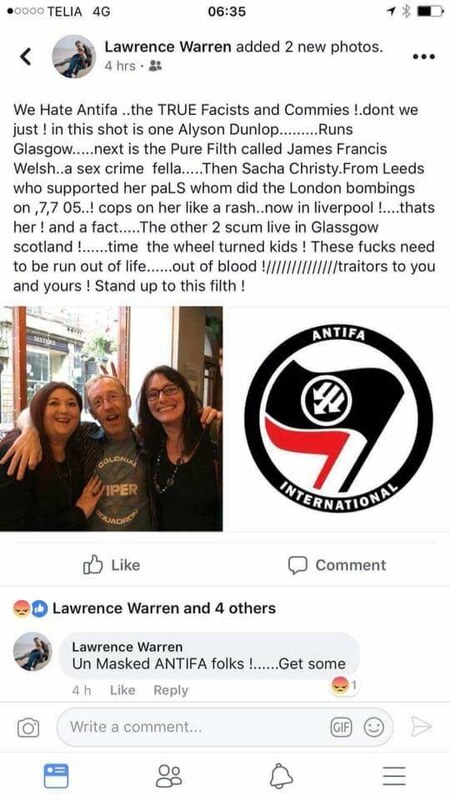 "Should be run out of life, run out of blood" and "Get some"
He has also handed my address out. No, we can't believe the police won't do anything about it either, but they say it isn't a direct threat and it wasn't sent to me. They use the lack of police action as some kind of proof of his innocence.